Ramadan at home without the cooking: Bring me food! If you’re in Cairo for the last week of Ramadan or in the compounds of either Amwaj or Marassi in the private developments on the Mediterranean sea, one good setting to see-in the Eid holiday is the modern Lebanese restaurant Al-Dayaa . The main branch in Cairo is on Maadi’s Road 231, a 20 to 30 minute walk from either Maadi or Sakanat Maadi Metro stations; or a five-minute walk from the Cairo American College. The North Coast branches open seasonally, depending on management. The Maadi branch is exactly what any gathering would wish for of an evening: iftar-to-sohour or late-lunch-to-early-dinner. A pleasantly decorated two-storey setting, with colourful prints from floor to ceiling, Al-Dayaa is clearly a welcoming place. The staff are relatively friendly - their intonation of ‘how’s your food’ not overly aggressive. The menu promises something genuinely Lebanese. Hence they serve assafir (literally, ‘birds’) for those looking to go Lebanese all the way – to kebba nayah (finely crushed raw meat), although this is not actually available. 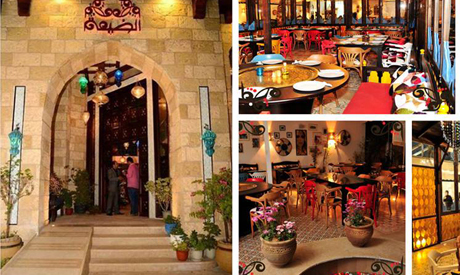 Al-Dayaa offers an array of starters, both cold and warm. The hummus is great in all its varieties, with shankleesh (balls of cow or goat’s milk) the runner up among the cold mezze, ahead of the other dishes. Mini-shawerma were a comfortable first in the warm mezze contest, followed by fried kebba before the other dishes. 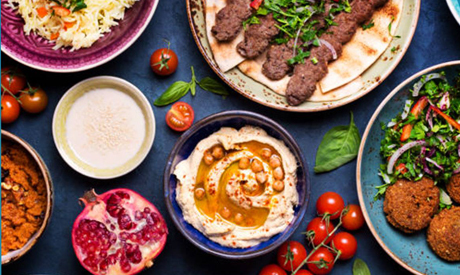 But whatever you do with your first course of what will inevitably end up as a Lebanese feast, don’t miss the chance to dip your bread into any of the many splendid hummus varieties. For the main course, Al-Dayaa’s menu is as much inviting as it is perplexing: with multiple grill choices including jumbo shrimps, these are a great choice for the ultimate Eid holiday lunch. However, it could be more appropriate to opt for the grilled meat and chicken that come in so many varieties. Those looking for a lighter choice can’t go wrong with any of the grilled koftas. For anyone less into meat, or who wishes to evade the predictabilities of the grill and foray instead in the oven selection, try sawani min el forn, and the mix of bite-sized chunks of meat and chicken with sautéed tomatoes and onions in a cottage pie style dish. Aside from the grill, Al-Dayaa has a large selection of fettah, baked fish fillet with red sauce or tahini, all served with traditional Egyptian-style white rice. Al-Dayaa’s menu carries through the Egyptian touch above and beyond the bread and white rice to include the Ramadan extras of molokheya, bamiya as well as the guest star misaqqaa. Although not on the regular menu these are pretty good, especially the bamiya. There’s also a Jordanian touch - a foregone conclusion considering the owner is a Jordanian, whose expertise selling Levantine cuisine to Egyptians is approaching 20 years. This leads us inexorably to mansaf (soft lamb cooked in fermented yogurt with rice), served only if pre-ordered. No matter how much you’ve indulged, don’t miss the ghazal Beirut dessert (mastic ice cream topped with cotton candy). For afters, tea with mint is served in quaint little glasses. Shisha is also available. A couple could have quite a generous iftar, dinner or lunch meal for around EGP 800. If it’s sohour, or just drinks and shisha, this could easily be reduced to under EGP 500. For the remainder of Ramadan and for World Cup nights, reservations are recommended.